You’ll need a boat or a comfortable pair of walking shoes / sneakers to get to Cathedral Cove, one of the Coromandel Peninsula’s most beautiful beaches. The walking track begins at the northern end of Hahei, and takes about 40 minutes. 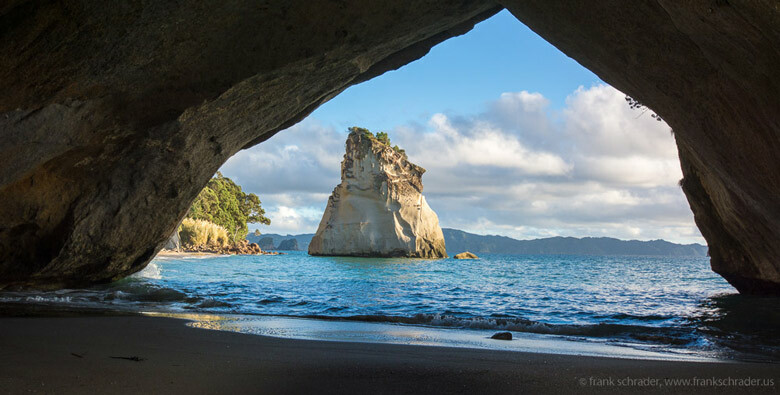 Just offshore from Cathedral Cove is Te Whananui-A-Hei, a marine reserve known for spectacular dive sites. This is probably one of the most well known walks on the peninsula. From Cathedral Cove visitors can access Te Whanganui-A-Hei Marine Reserve as well as Gemstone Bay, Stingray Bay and Mare’s Leg Cove. A snorkeling trail is located in Gemstone Bay. Cathedral Cove is so named because of the natural rock arch joining it to Mare’s Leg Cove. In time, this arch will collapse to form an offshore stack such as Te Hoho Rock at the northern end of Cathedral Cove. Directions: The track is located near the small village of Hahei. From the Hahei shops take the signposted road to the lookout carpark. Due to its popularity the carpark can be full particularly during the summer months so visitors may wish to park at an alternative site accessed from the northern end of the Beach carpark (allow an extra 25 mins each way). You need to go about 3 hrs before or after low tide, otherwise the beach is almost covered with water and not accessible. Ideal time to go is at sunrise and then walk the trail down to the cove. You have excellent chances that you are still quite alone there. 2 hours later it will be a crowded place.